Whether dashing and prancing with ruddy noses or stampeding across the tundra, reindeer and caribou evoke a sense of life in Earth’s far north. Living in the harsh environments of the Arctic and Subarctic, populations of both reindeer and caribou—members of the Rangifer genus—naturally vary in number over decades. 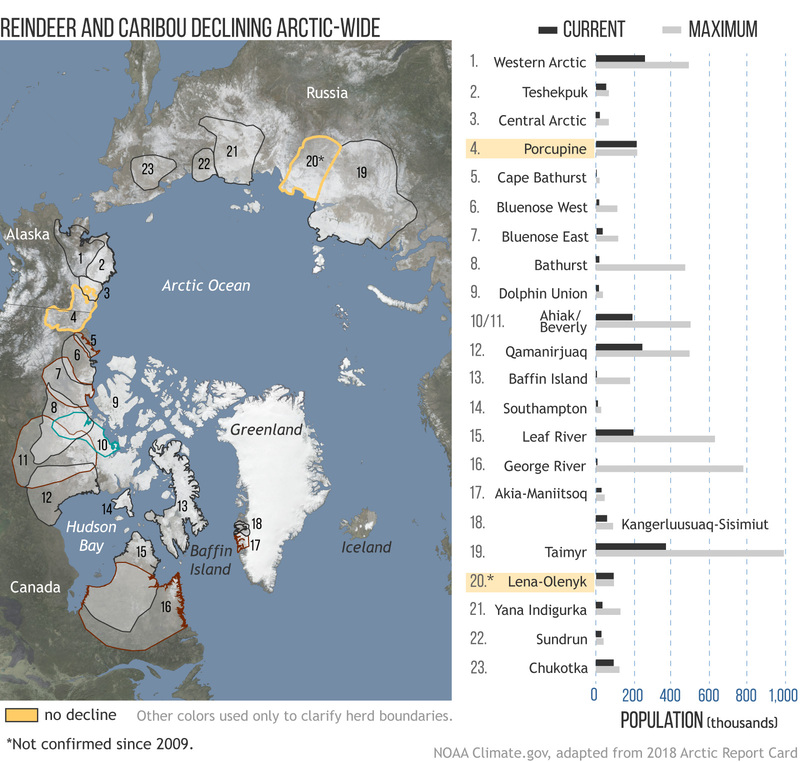 But the abundance of migratory reindeer and caribou has continuously declined since the mid-1990s, according to the 2018 Arctic Report Card. Only 1 of the more than 20 monitored herds is confirmed to have populations near their historic high numbers based on updated estimates since the 2013 Arctic Report Card. The image above shows the location of 23 major reindeer and caribou herds along with a chart of how their current population numbers (dark gray bars) compare to their historic maximum (light gray bars). Gold is used to highlight the only herds that are or were near their historic highs at last count: the Porcupine herd in Alaska and Canada, and Russia’s Lena-Olenyk herd. The Lena-Olynyk herd in Russia was last counted in 2009, however, and current estimates are not available. Other colors are only used to clarify overlapping herd boundaries. Overall abundance of reindeer and caribou has declined 56 percent from a total estimated population of 4.7 million individuals to about 2.1 million individuals over the past two decades. Five herds in particular, in the Alaska-Canada region, experienced such drastic declines that recovery isn’t in sight. In the U.S., of the four tracked herds, three peaked sometime between 2003 and 2010 only to decline 57 percent by 2017. But at the same time, the Porcupine herd, which roams Alaska’s northeastern region and also ventures into Canada, is the only herd to recently increase to historic peak numbers without any subsequent decline. The Lena-Olenyk herd in Russia, noted to have been at historic numbers in 2009 hasn’t been counted since. Other herds around the world aren’t faring as well as the Porcupine herd. In Canada, nine herds declined so precipitously that barren-ground caribou are now nationally listed as Threatened, and two herds of Eastern Migratory Caribou are now considered Endangered. In Russia, 18 of 19 assessed herds are considered rare, decreasing, or Threatened. Scientists can’t always easily pinpoint the causes of a herd’s decline because reindeer and caribou are at the whims of a number of interconnected challenges. Herd population declines can result from an increase in parasites, diseases, predation, and hunting as well as reductions in foraging availability. Climate change overarches many of these other challenges. A warming world increases drought and affects foraging, allows for the spread of more diseases and parasites, and could also be causing heat stress in the animals, which weakens their ability to resist diseases and withstand food shortages. Continued and increasing declines in reindeer and caribou herds pose a threat to the food security of indigenous communities who traditionally rely on the herds for food. Natural ecosystems also face threats from reduced reindeer and caribou populations because they are a key species of the Arctic food web; as the region’s primary foragers, they help cycle nutrients from plants back into the soil, and their abundance is a primary control on predator and scavenger populations and behavior Arctic wide. More information about reindeer and caribou herds in the Arctic can be found in the Rangifer chapter of the Arctic Report Card.